Up at bloody 6am today; the thought of the damn Tories getting back into power startling me awake after a scant five-hour snooze. Bleary-eyed and itching with Election Day irritability; what's to do? Well, there's a rabbit that needs to be butchered and cooked for a start so have a roll-up, a bucket of coffee and get on with it. Bugger the Tories. 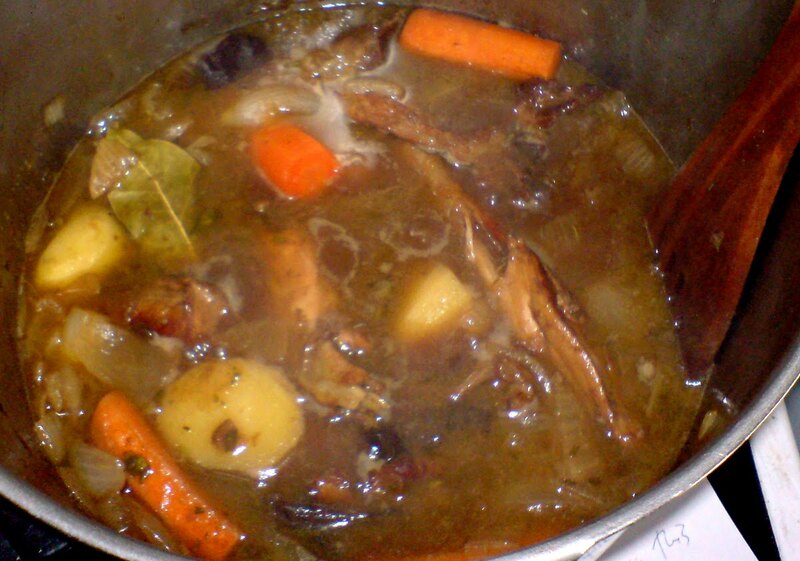 Make a stock with the bones and a pile of thyme, bay and rosemary from the window-box; splash in a bit of Balsamic and a quarter-bottle of Red that was lying around; slop a dollop of Agave Nectar in there as well to offset the sharpness of the vinegar. Fry the meat in sunflower oil till golden, then coat in rye flour and seasoning and bake in a hot oven for a wee while (no idea why really, just seemed like a good idea). No more oil left so fry onion in butter and add more herbs, carrots and spuds chopped peasant-style, i.e, barely chopped at all. Separate stock from herby carcass. Add to now-golden fried onions with veg, meat, a handful of prunes and salt 'n pepper too. Stew at a just-simmering roil for a fair old while - maybe an hour and a half. Later I'll fry the liver and kidneys in butter and add just before serving. My local Labour M.P is a chap called 'Kidney' as it happens, so, still knackered and woozy, I'm off out to vote for him. Tomorrow, we may wake with a groan to find that the nation has looked to the boys from the Bullingdon Club for 'leadership'. God help us all. Your food sounds WAY better than your election. But who am I to talk? We're looking for a new governor in California this year - that'll be quite a treat. I am going to try this recipe later. There is nothing like a good stew to take your mind off the election!!! Sorry this is a rather late reaction to your post..however, you may have remembered a post i made on your .177 Vs .22 debate...i made it as an annonymous poster and my post contained details of an experiment i carried out with teracotta wax to show that .177 pellets made larger channels on impact?? well....here i am...and must say its great to see that your a Labour voter too....im as anti tory as they come...i think people assume because i hunt regularly i must be a Tory snob...so we both prefer .177 to .22 and we're both Labour......you just got yourself a follower my friend haha. Mortimer, Oh my giddy god, it's true, we now have a bloody Tory government. Don't get me started! Nick Bloody Clegg. Bloody, bloody, bloody, bloody....[etc].